The Residency Program boasts outstanding board-certified faculty, as well as opportunities to excel in clinical ophthalmic research. Moreover, it offers diversity in patient population, ophthalmic diseases and eye surgical training. Residents develop a strong base in comprehensive ophthalmology and have extensive experience in each subspecialty area including cataract surgery techniques, retina/vitreous, neuroophthalmology, oculoplastics, cornea, uveitis, ocular oncology, glaucoma, pediatric ophthalmology and refractive surgery. 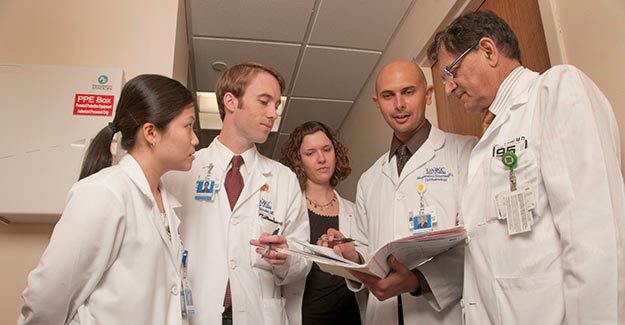 PGY-2: (Year 1) Emphasis is on fundamental clinical diagnostic and therapeutic skills – comprehensive examinations, assisting in ocular surgery, supervised laser procedures, and clinical research. Residents spend 11 months at Truman Medical Center-Hospital Hill and one month at Children’s Mercy Hospital, and participate in an introduction to ophthalmic surgery rotation at the Eye Foundation of Kansas City. PGY-3: (Year 2) Clinical responsibilities increase with exposure to major intraocular and extraocular surgical procedures. Rotations include four months at Truman Medical Center Hospital Hill; four months at Children’s Mercy Hospital; and four months at St. Luke’s Hospital in specialty rotations including neuroophthalmology, ocular oncology and glaucoma. PGY-4: (Year 3) Residents receive more intensive clinical exposure and responsibility for major surgical cases including refractive surgery. Rotations include 8 months at Truman Medical Center Hospital Hill and 4 months at Truman Medical Center Lakewood. The program offers a broad array of daily educational conferences and didactics. Weekly conferences include topics in ocular oncology, cornea and uveitis, oculoplastics, eye trauma, retina, pathology, glaucoma, cataracts, pediatrics, and neuroophthalmology. Monthly conferences include journal clubs, ethics and professionalism didactics, practice management, pediatric grand rounds, and pathology lab (ten months per year). Grand Rounds and morbidity/mortality conferences occur monthly involving the entire department. In addition, the residents meet regularly for study group. Residents are introduced to surgery in their first year. Training and practice is provided through a combination of surgical wet labs, cataract surgical simulation, suture practice and off-site surgical courses. Monthly self-directed practice with the Eyesi surgical platform and surgical wet lab is required. Multiple group wet labs are held each year to teach cataract surgery (phacoemulsification and extracapsular cataract extraction), glaucoma surgery, and suturing techniques. Finally, second- and third-year residents are provided with multiple opportunities to attend industry-sponsored cataract and refractive surgery courses.